Sleep Apnea is a medical condition, which means it is important to include a medical professional in the treatment process for dental sleep medicine services. While dentists can treat obstructive sleep apnea, we cannot diagnose it ourselves. What we can do is ask questions and pay attention to symptoms. Beyond that we need a sleep physician to help us in the diagnosis process through a sleep study. 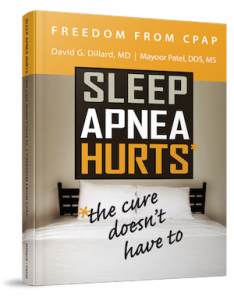 Through a working relationship with a sleep physician, you can send patients for diagnosis while also receiving patients for treatment with oral appliance therapy if they become CPAP intolerant. At the end of the day, there is an easier solution: You, the dentist. By completing continuing education to advance your services to include sleep apnea care, you can save patients time and money spent on figuring out what might be the problem. Most patients are treated with oral appliance therapy as the leading form of treatment for sleep apnea due to their convenience and ease of use. As a dentist, you can offer your patients oral appliances to ensure accuracy and provide the best results. Take charge of your practice and help your patients get a better night’s sleep while also improving their overall health and well-being by screening for sleep apnea. At the end of the day, if you’re not saving your patient’s life through sleep apnea screening, then who is? The future of dental sleep medicine is bright. With numerous opportunities to provide value through improved patient care, your options are endless, so take charge as soon as possible and start screening your patients for sleep apnea. It has become increasingly clear that there is a link between sleep apnea (airway), bruxism and craniofacial pain, in some patients and dentists should be knowledgeable in all three areas. Most dentists are not knowledgeable or well-versed in dental sleep medicine, etiologies of bruxism or craniofacial pain conditions. For this reason many dentists are unable to recognize the risk of sleep apnea, let alone manage patients with oral appliances. The same goes for craniofacial pain and bruxism. While bruxism is often more noticeable, it is often overlooked. By understanding the unique connections between the airway, bruxism, craniofacial pain and other conditions, dentists can open their practice to more services for diagnosis and treatment options for their patients. Here are the ABCs of advanced dentistry are Airway, Bruxism and Craniofacial Pain. Dental practices are in a unique position to identify patients at risk for conditions involving the airway, such as sleep disordered breathing (SDB). There are many levels of diagnosis a patient may receive once testing has been completed to evaluate a suspect compromised airway, which is where continuing education comes into play. Understanding the airway and how it can affect a patient’s sleeping patterns due to sleep apnea and other sleep disordered breathing conditions is vital in maintaining your patients’ health and improving service offerings. The gnashing and grinding of the teeth that occurs without a functional purpose is called Bruxism, which can cause a lot of problems for our patients. Whether a patient has a nervous habit, is experiencing stress or is unknowingly grinding their teeth at night, bruxism can cause a lot of damage to not only their teeth, but their overall health as well. Due to the breakage of dental restorations, tooth damage, induction of temporal headaches and temporomandibular joint disorders (TMD) can occur. And now it comes full circle with craniofacial pain. Covering a wide spectrum of symptoms, Craniofacial pain can be exhibited in many areas of the head and neck. In particular, a majority of craniofacial pain complications can be associated with temporomandibular joint disorder (TMD). Because of this, an essential part of routine dental examinations for all patients should include evaluation for TMD. This includes the gold standard for the diagnosis of TMD, which is based on history, clinical examination, and imaging when appropriate. There appears to be a relationship apparent in some individuals between the airway, bruxism and craniofacial pain. While it is not found in every patient, there still remain some individuals that require further attention because the connection seems apparent. As a dentist, it is important to understand that clenching or grinding of one’s teeth can be a way for the brain to protect itself from suffocation during sleep. Each condition can be a sign for a deeper problem, but what do you do about it? Educate yourself. The more you know, the more you can help your patients if this apparent connection arises in various cases. And, while it might not occur in every case, it is vital that we understand it for those certain individuals suffering from all three conditions. Join us in Chapel Hill, North Carolina for the 2019 Orofacial Pain Mini Residency! Led by renowned Dental Sleep Medicine and Craniofacial Pain experts, the continuum is ideal for dental clinicians who are just beginning to offer the treatment of orofacial pain, as well as those wanting to expand their knowledge and increase their experience in providing oral appliance therapy. The Orofacial Pain Mini-Residency is a comprehensive 2-session, 38 CE Credit program designed to give dental practices the knowledge and guidance to fully incorporate orofacial pain treatment into their practice. With an emphasis on hands-on learning, attendees gain the skills and confidence needed to be successful in all aspects of TMD & craniofacial pain treatment. Sleep apnea places stress on the heart, which is never a good thing. By treating sleep apnea, you can help protect your patients from hypertension, coronary artery disease, cardiac arrhythmia, congestive heart failure and sudden death. Sleep apnea’s stress on the heart should not go ignored. Take a look at the infographic below to learn more about sleep apnea and stress on the heart. Feel free to share the infographic with your patients so they too can better learn about this stress on their heart. Sleep apnea places stress on the heart, but by providing treatment, you can continue to protect your patients. Contact my office today to learn more about this stress and how you can help.